GOLF CUP 2015 IN JESOLO, VENICE 18 holes golf tournament sponsored by Hotel Le Soleil * * * * at the Golf Club Jesolo on Sunday 21st June 2015. "Hotel Le Soleil - Golf Cup 2015" will be organized on Sunday 21st June 2015 at Golf Club in Jesolo, Venice. The event will take place throughout the day and let people play next to venetian lagoon. Golf players will start the summer 2015 with an amazing day with nature and fun. The day will continue with buffet and awards at Hotel Le Soleil, 4-stars hotel with sea view located 5 minutes far from Golf Club Jesolo . The aperitif will be sponsored by Canevel, very important winery located in Valdobbiadene (TV), and the prizes will be sponsored by Sun68, very famous apparel company located in Jesolo (VE) and Noventa di Piave (VE). All the players will receive a gadget. 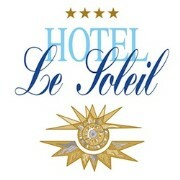 Hotel Le Soleil * * * * has been totally renovated in 2015. 174 rooms, 2 Suite Panorama, 1 international restaurant, 1 lounge bar, 1 pool-bar, swimming pool with Jacuzzi, small pool for children, 1 swimming pool, free WIFI in the whole hotel, terrace with sea view, parking, garage, private beach.